With the announcement of free 390,000 Monster Points being given out to all players over the course of March along with the highly anticipated evolutions for the original 5 MP Dragons, many players are excited to take the next step in their Puzzling adventure. However, these evolutions are challenging to perform and very few players are actually able to clear Arena 3 and acquire the Radar Dragon they need. Thankfully, we will now gain the ability to “easily” acquire any Radar Dragon of our choosing through a special hourly dungeon. While this is great for the most part, these dungeons are actually very challenging and feature their respective Radar Dragon in a buffed form compared to their Arena 3 counterpart. However, the dungeon is quite short in nature and there are many different strategies for efficiently dealing with each encounter along with the option to simply stone to continue if you badly need the drop. I plan to clear and record all of the dungeons and will upload the team/video to this post as they are released. If you want to read more about which MP card to purchase, please refer to my guide HERE. Karin has God and Dragon Killer which enables her to deal incredible burst damage against all 3 floors and 9x to Heph. You should plan out who will be receiving the 15 turn skill delay and try your best to use actives from that side wherever possible. In my case, Player 2 is delayed. On the final floor, you can trigger the resolve as it will heal him to 50% HP and 1 health. You simply need to ping with any source of damage to remove the resolve. Sarasvati could easily be replaced by any high damage glass cannon leader. You should prioritize heavy orb changers as it is simply a burst and kill scenario. If unable to inherit Raphael , can simply use him as a sub or use a large shielding sub to survive. Do your best to return to full health every turn. Killer awakenings are very powerful here as there is no absorption mechanic and the resolves are not too hazardous. You can hit Heph into resolve and then have him resurrect without taking any damage. Do not bring a dark team. Also, find a team that has very high damage output. Pretty much the only hard requirements. You can simply stall the 99 turns, but that is quite a grueling experience and if you want to kill faster, you need to have appropriate damage control. Do not use Killer awakenings. 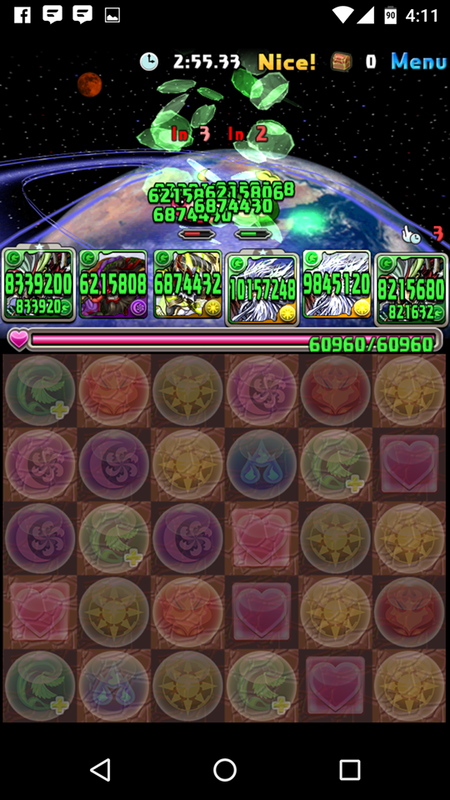 Noah Dragon VOIDS all damage above 5 million. Void means it will deal 0 damage when dealing more than 5 million damage and means cards like Fujin have no effect. The above team is pretty much my Arena 3 team. This comes out to around 50-51 million damage and you only need 48 million to kill Zeus after the Gravities. Tengu will have a tiny bit more attack when I inherit Green Odin. I had to make an adjustment to my team as people have pointed out that 20 million damage from the Sakuya Gravity would be voided (I thought 20 million was safe) so I am using Famiel to tickle for 100,000 damage then proceeding as normal. You must use Gravities in the order that is listed. For some reason my Hera-Beorc is missing from my box so I am doing this strategy instead of using her 10% gravity. Player 2 can have dark cards as the binds only hit the Player 1. I have 3 SDR on most of my Player 1 cards and the 2 turn haste from Mori help brings those cards back up. You cannot use a 50% damage reduction shield as this Hera Dragon hits significantly harder than the Arena 3 version. On Hera Dragon, you must never match more than 6 connected water orbs in a row formation. You can go for 7+, but it has to be in a blob. The amount of combos you make is dependent on the number of your Orb Enhances and Row awakenings your team has. The three Gravities push Ceres below her 30% resolve right away and any combination you can configure that achieves the same result is fine. A very popular strategy is to use Reincarnated Hades and his massive dark damage reduction to cheese your way through. Just make sure you bring a 10 turn bind clear for the first floor. I will continue to update and populate the team rosters as I do more research and actually play the dungeons along with uploading the videos right away. Best of luck in acquiring your Radar Dragons. I have played an excessive amount of Arena 3 and, I have over 130 clears along with 43 Radar Dragons at the time of this posting. Arena 3 is by no means an easy dungeon, but with more end game teams available and half stamina cost, more players are able to start their journey. This post will cover the general strategies when approaching Arena 3, but will not cover specific teams. If you wish to view all the teams I have used to clear Arena 3 and their respective inherits and latents, feels free to check out my previous guide HERE. When entering Arena 3, you will have to accept the fact that you will not have a 100% chance to win as any number of deadly spawn combinations along with certain Radar Dragons will counter various teams. You can do your best to mitigate the risk through fully invest cards, research, experience, and coop. In my previous post, I go into detail of my strategies I use to clear Arena 3 along with my lack of luck with acquiring the Radar Dragons. However, that all changed tonight on my Twtich Stream (I go live every Monday and Thursday at 6pm PST) where I finally got Noah Dragon to drop! 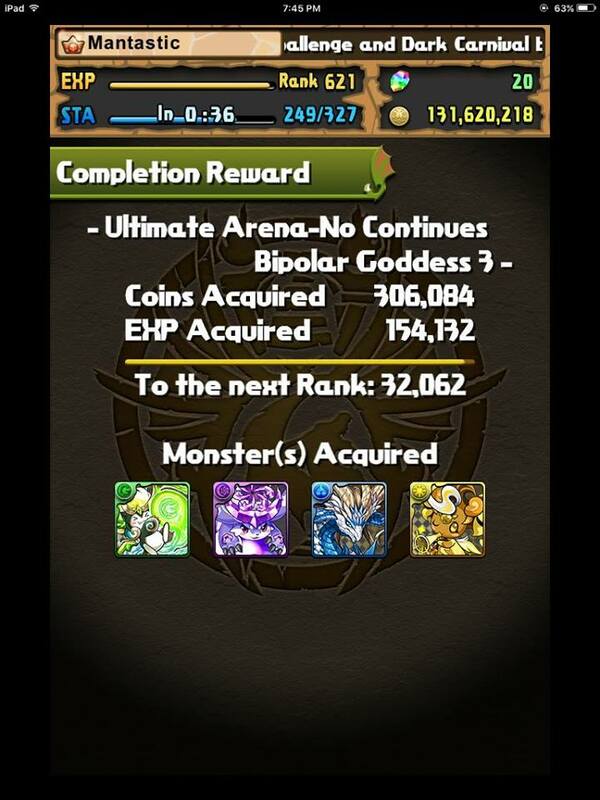 I guess all it took for the GungHo Gods to smile down upon me was to write a guide to help everyone else! As a fair warning, there may be some inconsistent issues with sound as I am uploading from my Twitch Stream and there may be copyright issues. I should stream Arena 3 runs more often! But in all seriousness, this was the first time a Radar Dragon has ever dropped and I am pretty happy about it. Hopefully these videos prove helpful for those venturing into the dangerous waters that are Arena 3. For those who follow my Twitter, you may have seen my tweets showcasing my various Arena 3 clears and my lack of Radar Dragon drops. However, my consistency in clearing Arena 3 is only improving with each attempt and I wish to share my experience and strategies to help enhance your own chances of success. Very few players have been able to clear Arena 3 and from various Google searches, even fewer discussions/guides. Just bear in mind that a lot of my strategies and advice revolves around using a Myr team in coop as that is the only high end leader I possess. Other favourable leaders with high clear rates include, but not limited to: Ronove , Kaede , Ra Dragon , Xiang Mei , Gremory , and Sherias Roots . Just keep in mind that no team can have 100% clear rate and you have to go in with the mindset that certain Radar Dragons will ruin your run.